The South of Tyne and Wear Memory Protection Service provided by the Northumberland, Tyne and Wear NHS Foundation Trust is a specialist care led service with primary care support serving 84,000 people living in Sunderland, South Tyneside and Gateshead. They have a single point of access manned by nurse practitioner duty workers who respond and direct patients and carers. A nurse will do initial tests then the patient sees the nurse and the consultant and continues for tests if needed at the hospital. Contact for further assessment, information, help and support as needed even after you have been discharged. The benefits to the scheme are that anyone can call for advice and support and it is available through a single number. There is choice about where the person can be assessed, specialist tests are provided close to home and an education package are available for both patient and carer to help them come to terms with diagnosis. The evidence shows people who attend the group adjust ‘fantastically well’. It costs £877 per patient per year without the education cost. The Memory Protection Service (MPS) was commissioned in April 2012 as a diagnostic service for people of all ages who may have dementia. It is inclusive of all disabilities including learning disabilities. The aim is to provide local primary and community services to support early diagnosis and intervention for cognitive impairment. The service was developed as an enhanced Primary Care diagnostic provision using GPs with Special Interest (GPwSI) to work alongside secondary care and provide the memory protection role for approximately 84,000 residents of South Tyneside, Gateshead and Sunderland. The service provides a key access point to the dementia care pathway in each locality, ensuring that any contact or referral of a person with possible dementia is responded to appropriately. Either the carer or the patient will be transferred to appropriate services through the MPS if applicable. 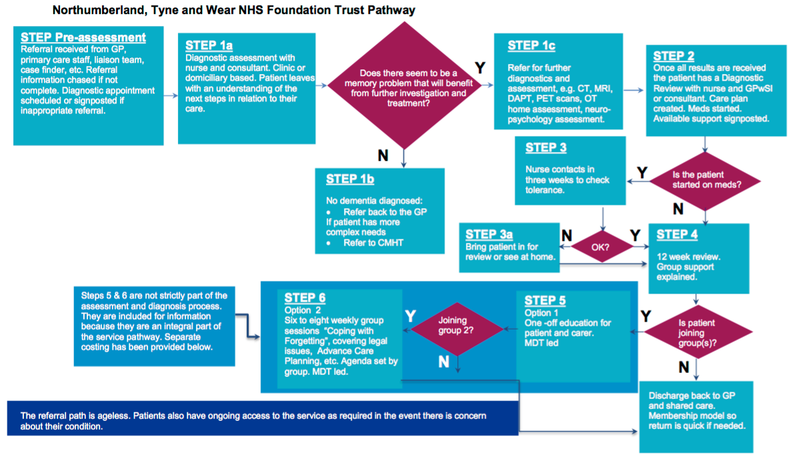 The diagram below illustrates the dementia care pathway. Across the localities there are 155 GP practices of varying size. One of the challenges of developing the service has been negotiation about pathway transitions with three different localities and three different Community Mental Health Teams. Prior to referring to the MPS, the patient’s GP is asked to complete a cognitive screening. Referrals, including self-referral for each locality are written or emailed from various sources such as liaison teams, intermediate care facilities and other primary care staff. Generally, the patient is informed that they have been referred. All referrals are first screened at the MPS single point of access by one of the nurse practitioner duty workers who triage the referral. At this point a small number may be redirected to the secondary care Community Mental Health Team if it is apparent that the person’s needs are more complex than routine diagnosis. The duty workers are also responsible for initiating the pathway for self-referrals and if necessary, for managing further information requests in order for a referral to be allocated. The duty workers also respond to all other enquiries from service users, members of the public and GPs, and undertake all routine telephone reviews. A nurse will do a full assessment with cognitive testing using the Addenbrookes Cognitive Examination, ACE-III. The patient will then see the consultant and the nurse. The consultant might conduct a brief physical examination or assess mood or ask further questions. The consultant will explain initial findings and the intended plan at that point. The patient might be sent for a scan, other concerns discussed or a referral back to the GP made, for example in the event that the patient is depressed. A letter is generated from the diagnostic assessment and the patient will get a copy. The default is that the patient gets a copy of all letters unless they have specifically said they do not want them. These will be the same as the letters the GP receives. All letters have been reviewed to make sure they are jargon free. In accordance with current NICE guidance everyone for whom a diagnosis of dementia or borderline dementia is expected will have at least a CT scan, but they might also receive an MRI, DAPT or PET scan. The acute Trust completes the scans – the timeliness of the outcome response can be variable across localities. Once all results and assessments are complete a diagnostic appointment will be offered with either a Consultant or GPwSI. The diagnostic appointment delivers the diagnosis supported by the scan results and other assessment information. Generally this will support what the Consultant has already provisionally agreed at the professional MDT. At the diagnostic review, pre-diagnostic views are reconsidered and the patient’s symptoms reviewed to see if there have been any changes or additional risks. The diagnosis is delivered and treatment options discussed as well as support and local groups available, lasting power of attorney, driving, etc. A comprehensive letter detailing the diagnostic review discussion is completed. It can then be used as a plan of care for the patient. The MPS also shares it as instructed by the patient. If the patient is to start on medication, this happens at the diagnostic review. The duty nurse will phone the patient in three weeks to check the patient’s interaction with the medication. If indicated, the consultant will write a new prescription which is sent to the patient. Titration is managed through this contact. If the patient’s condition has changed or they are not tolerating the medication well, the patient will be brought in or seen in their home. Twelve weeks after the diagnostic review all patients are offered a post diagnostic appointment with the nurse. At this point access to education and support groups are discussed and offered again. Should the patient decline the offer of group work they will be signposted to voluntary services within their locality for extra support and will be discharged back to the GP. At any point throughout the process if the patient deteriorates or is unable to tolerate medication, a review appointment will be offered with either the GPwSI or the consultant. An alternative care plan will be implemented which may include occupational therapy or psychology involvement. There are two groups that patients may opt into; an education group for patients and their carers, which is a valuable early journey peer support system, and a “Coping with Forgetting” closed group run by the clinical psychologist with another member of staff just for patients themselves. There are six to eight places and the group meets for an hour and a half each week for six to eight weeks. The purpose of the group is to support the person to come to terms with the diagnosis of dementia. All groups are evaluated and the outcomes are always positive. Groups have a steady flow of uptake throughout the year. The evidence is that people who attend the group adjust fantastically well. Discharge is completed between nine to sixteen weeks should there be no complications throughout the process. The team are currently addressing areas that delay the process to ensure that the service is more efficient. There is some scope to trim the length of the process, particularly with streamlining appointments for scans, psychology, etc. and contracting for more timely results.